Accuracy The distance between the point where fire is aimed and the mean point of impact of the fall of shot. In artillery inaccuracy is mostly the result of inaccurate data to correct for non-standard conditions, or not bothering to correct for these at all. However, there are many other minor sources and a major error, such as in survey, can have a significant effect. However, 'accuracy' or 'inaccuracy' is not an innate characteristic of a particular type of gun. The function of command dealing with the maintenance of forces in the field, including the direction and control of the services and all measures needed to meet the daily requirements of the troops. General administration was controlled by higher formation HQs. Local administration was the responsibility of unit commanders. Army Group RA, in essence an artillery brigade, they were 'army troops' and usually assigned to corps. The number and type of regiments in an AGRA was not fixed, but typically 5 or 6 mostly medium regiments and a heavy regiment. Commanded by the CAGRA, a brigadier. Aiming Point Method A method of orienting the guns of a troop without using a director. It involved an angle to a visible distant point. A type of GAP that was close to the gun but provided 'virtual infinity' to compensate for the movement of the dial sight when the gun traversed or moved back ('bedded-in') during firing. Used in pairs, British aiming posts had a cross bar. One of the types of aiming point used by each gun to compensate for the movement of the dial sight when the gun traversed or moved back ('bedded-in') during firing. Picture. More details in 'Sights & Laying'. A light aircraft (Taylorcraft Auster) piloted by an artillery officer who observed and ranged artillery fire using normal artillery procedures on artillery wireless nets. They were organised in RAF squadrons, normally allocated one per corps. More detail in 'Other Firepower'. Angle of Sight The vertical angle at the gun and usually set on guns' sights that compensated for the difference between the altitude of a battery and its target. A ballistic angle. Apex Angle The angle at the target between the line of fire and the observer's view to the target. Angle T in modern terminology. The Army Council commanded the British Army. It comprised elected politicians, the most senior military officers and War Office civil servants. More detail in 'Higher Organisation'. A board up to 30 inches square covered with gridded paper (either 1:25,000 or 1:50,000 scale). A brass pivot represented the pivot gun with a steel range arm rotating about it along a steel bearing arc. It enabled map data (range and switch) to be measured accurately. Artillery boards were first used in 1915. It could be placed on a flat(ish) surface or mounted on Stands, Instrument No 27. Picture. It lasted until about 1957 when it was replaced by the Plotter, Fire Control, although it was retained for peacetime range safety plotting for decades after that. A set of two and three letter abbreviations, sent using Morse code, covering artillery matters including artillery fire order terms. It was used with Morse code for telegraph (and visual) signaling. Survey processes to determine the three dimensional map coordinates (fixation) of a specified point and or the bearing relative to grid north of a specified azimuth (orientation) at a specified point for artillery purposes. More detail in 'Maps and Survey'. The mechanism used to close and lock a BL breech. The upward movement through about 90 degrees of the breech mechanism lever swung the breech block though about 90 degrees into the breech ring then rotated it though about 40 degrees to lock it in position. And the reverse motion to open it. A barrel manufacturing technique to strengthen a barrel by stressing it. Widely and incorrectly used to mean 'heavy artillery fire'. In British practice a barrage had precise meaning, it was a moving or stationary ('standing') belt of fire providing a protective screen behind which the attackers advanced or defenders were positioned. It was fire applied in a series of lines in lanes, it was not aimed at specific targets but at an area. A moving barrage could be creeping ( the fire of all units remained in the same relative position and moved line by line), rolling ( fire of units leap-frogged the lines engaged by each other) or block (all the lines engaged simultaneously lifted together to the next block of lines). See Barrage Layouts. A shell that ejected its payload in flight after blowing off its base plate. This form of shell was developed between the world wars. Used by UK for smoke, flare, star and chemical replacing older versions that were shrapnel (forward projecting) or bursting type. See 'Ammunition' for more details. The part of a carriage or mounting that provides a stable support for the superstructure that supports the ordnance. With a carriage it includes saddle support, trails and wheels. More details in 'Gun Structures'. The term 'Battery' was adopted by the Royal Artillery in 1859, it replaced 'Company' in field and garrison artillery and 'Troop' in the Royal Horse Artillery. In 1874 the rank of an officer commanding a battery was changed from captain to major. When the rank of the BC was increased to major, in 1874, one of the 4 subaltern officer positions was raised to captain. He became known as 'The Captain'. However, in 1938 troop commanders were created in batteries, and they were captains. At much the same time vehicles started being marked with 'tac signs' and that for The Captain was 'K'. It became the practice to refer to The Captain as the Battery Captain or more colloquially the 'BK'. A horizontal angle (azimuth) measured clockwise from North. For artillery purposes this was Grid North unless stated otherwise, eg either Magnetic or True North, and measured in degrees and minutes (360° to a circle, 60 minutes to a degree) until mils were introduced. Engagement of enemy batteries from the Hostile Battery (HB) list using predicted fire, usually as a fire plan, either scheduled or on-call. See 'Target Acquisition and Counter Bombardment' for more details. From 1920 an artillery rank equivalent to corporal. Brigadier Royal Artillery. Usually the senior artillery officer at a Command or Army Headquarters. A type of ordnance where obturation was provided by the breech mechanism and cartridges were bagged without a metal cartridge case. Picture. More details in 'Ammunition' and 'Gun Structures'. Brigade Major Royal Artillery. The CRA's principal staff officer in a HQRA at division or corps with the rank of major. That part of the recoil mechanism that controlled recoil. Basically, a piston in an oil filled cylinder that allowed oil to pass from one side to the other. The other part of the recoil mechanism was the recuperator. For more details see 'Recoil and Runout'. Firing to determine the MV of guns, either by instrumental measurement close to the muzzle or by observing and precisely locating fall of shot and comparing it with where it should have been, then removing all the known variations by calculation and attributing what was left as a correction to MV. For a description of calibration throughout the 20th Century see 'Calibration' page. Sights with a gun rule integrated into the dial sight carrier. In the 1930's the Probert pattern was adopted for all guns. A means of describing the curvature of a shell's nose (or ogive). Either a tangent ogive expressed as one number or a secant ogive expressed by two numbers, eg '5/10', a 'fractional crh'. Crh is fully explained in 'Ammunition'. The structure of the gun that supports the ordnance and has wheels in contact with the ground when firing. More details in 'Gun Structures'. Carrying Power A term used for the ballistic co-efficient. It means that starting with the same velocity, the heavier projectile will go further. More details in 'Ballistics'. Commander Corps Medium Artillery, a Brigadier, position abolished in 1942 when AGRAs were created. The process by which the fixation and orientation of pivot guns and recorded targets were updated when higher level survey data became available, ie changing from battery grid to regimental grid to theatre grid. A propelling charge (cartridge) consists of several bags of propellant. In the British system these were often different colours. For 25-pdr, increments 1, 2 & 3 were red, white & blue bags respectively. All three bags comprised charge 3. Charge Super was a separate cartridge giving a range of 13,400 yards. There were also different types of propellant, where the cordite granules or sticks varied in the composition and shape (eg NQ, NH, WM). Cartridges were QF or BL. More details in 'Ammunition'. A security 'tool' for protecting transmitted (usually by wireless) information. An instrument measuring angles relative to the horizontal plane. A Sight Clino was used to lay a gun, with calibrating sights, in elevation and was fitted to the dial sight carrier. Its bubble was leveled by elevating the barrel. The sight clino was set with the Angle of Sight (all guns used the same A of S, zero was usual for observed fire). A Field Clino, US term 'Gunner's Quadrant', was used for laying in elevation instead of calibrating sights or when maximum precision was required. It was set with the Quadrant Elevation (Tangent Elevation plus Angle of Sight ). A means of abbreviating information, the 'Artillery Code' was used by artillery. The term 'CP' was used for elements in batteries responsible for technical command and control, Troop and Battery CPs (TCP & BCP) in field artillery did the various technical calculations to produce firing data for the guns. In WW2 the CPO was responsible for the BCP and overall technical control of the battery. The term was introduced in 1938. With the reversion to 6 gun batteries in the late 1950's the term applied to the officer, warrant officer or senior NCO who was in charge of one of the BCPs. Officers, sometimes battery or regimental commanders from non-divisional artillery regiments although any observer could be designated, called 'CCRA/CRA/CAGRA Representatives'. These observers were authorised to order fire to all the units under their represented commander's control and had wireless communications to all the units and HQs under that command. Comparator A mechanical analogue computer used by sound-ranging to plot the fall of shot of counter-battery (CB) fire detected by sound-ranging microphones, compare it to the hostile battery location and compute a correction to the fall of shot. Converged in modern terminology, each gun is aimed at the same point instead of firing with barrels parallel (normal) or at individual aim-points (barrage lines, stonks, smoke screens). See second definition of Concentration in the next entry. There were two meanings. First as an alternative method of applying fire instead of using a barrage; one or more batteries 'concentrated' their fire on a particular target, at least sympathetic survey was essential for multi-battery concentrations. Secondly concentration was a fire discipline term for switches (horizontal angles in degrees and or minutes) to individual guns in a troop to correct for their layout, either to aim all the guns at a common aimpoint or to spread out their aimpoints along a line such as a barrage line. In this second sense 'concentrations' were usually associated with position corrections that provided individual guns with range corrections in yards. The name given to the original nitro-cellulose based propellant introduced in 1891. Probably so named because it was normally formed as thin cords. It is a low explosive. Similar formulations were given different names in different countries, for example 'ballistite' in France. Cordite was used in WW1 and probably in limited quantities with guns of that period in WW2. Strictly speaking the double-base propellants of WW2 were not cordite although they were formed in cords and not 'powder'. Commander Royal Artillery at a Divisional HQ with the rank of brigadier, at Corps HQ there was a Corps CRA (CCRA), also a brigadier. The corrections to range and line to compensate for non-standard conditions at a particular time. These included meteorological conditions (wind speed and direction, air temperature and pressure), propellant temperature, shell weight and rigidity of the trajectory. A means of changing the time duration set on a time fuze. It was set on the fuze indicator and so changed the fuze length for a given range. It was used to compensate for non-standard conditions and to range the height of burst. Most UK time fuzes used an arbitrary time scale so using corrector eliminated the need for observers to know the fuze model. The target acquisition, intelligence, fire planning and target engagement activities to defeat the enemy's artillery. The Counter-Battery Officer (CBO) at corps level was responsible for all intelligence about hostile artillery and the collection, co-ordination and dissemination of CB information. The WW1 term 'Counter-Bombardment' was often used synonymously with counter-battery and was re-adopted after WW2 when counter-battery and counter-mortar were combined. The title given to the second-in-command of a gun detachment. Part of the superstructure of the carriage or mounting that carries the recoil system and ordnance. Crest Clearance Command post and gun processes to ensure that shells did not hit hills between the gun position and the target. A step in the laying sequence to make the dial sight vertical. It corrected for the carriage being tilted laterally (ie roll) due to the slope of the ground. If the dial sight was not vertical then the gun would not be aimed on the ordered azimuth. The limits within which data derived by accurately ranging a datum point could be used. A few hours and a few thousand yard for guns and targets, with rules for applicability between different charges and different types of gun. Registration point in modern terms. It was accurately located, either by being a feature on the ground that was clearly and precisely defined on the map or by being surveyed. Special ranging and CP procedures were used to deduce a correction that compensated for non-standard conditions and errors in gun position survey. This could be used by all batteries within datum limits. It was the most accurate means of calculating a correction for non-standard conditions and was an alternative to calculating correction of the moment. The correct term for a gun 'crew'. Each role in a gun detachment had a number. No 1 was always the detachment commander role, No 3 was the layer while No 2 operated the breech. During training gunners were taught 'gun drill', the into, in-action and out of action duties of all roles on a particular type of gun. Detachment sizes varied with the gun, mostly between 6 and 12 men. The duties for each gun number are given in each gun data sheet. Final Protective Fire (FPF) in modern terminology. Normally one per battery selected in close consultation with the supported commander, guns were layed on the DF(SOS) when not otherwise engaged. Panoramic telescope in US terminology. The standard dial sights on all British guns were the Numbers 7 or 9, in several models, picture. Shortly before WW2 they were modified to convert them from 180 degs left and right to 0 - 359 degs. Some US origin guns retained their US panoramic telescopes in British service. In British service 'telescope' as a sight meant a direct fire instrument. British sights of WW2 were reciprocating (enabled cross leveling) and calibrating (compensated for differences from standard MV). 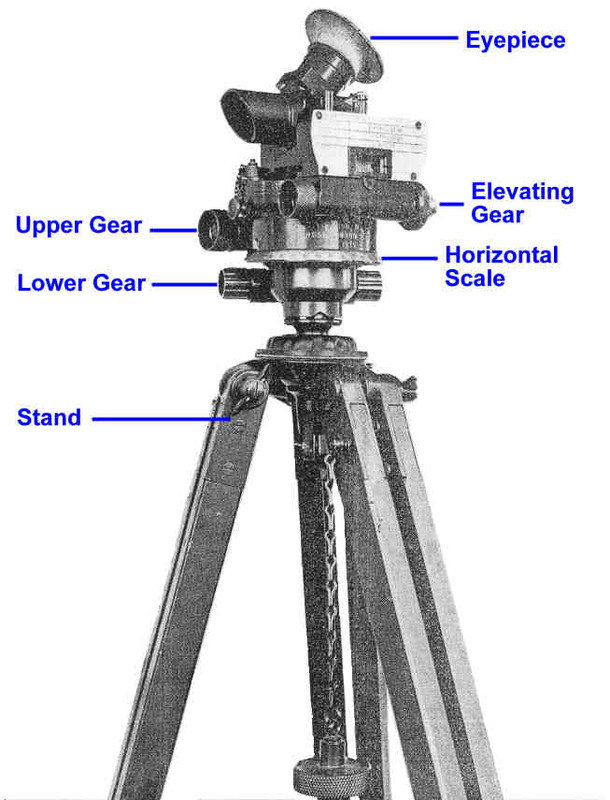 The dial sight carrier provided the mounting for the dial sight that could be cross-leveled to compensate for trunnion tilt, the gun rule that corrected the range for the gun's MV and in effect calculated Tangent Elevation, sight clinometer and drift scale. It also provided the mount for a direct fire telescope and open sight if these were provided. A nose fuze where frontal impact acted directly on a firing pin causing it to strike the detonator (after the fuze had armed itself when it was fired). The fuze did not function if the angle of impact between the shell's long axis and the face of the struck object or ground surface was too small. Called 'Super Quick' in US terminology. Aiming circle in US terminology. Directors were used to orient the guns in their Zero Line and for general survey within regiments. The standard directors throughout the war were the Numbers 6 or 7, in several models on Stands, Instrument No 17. Confusingly there was some overlap in the numbering of field and coast artillery directors. Picture. A copper band around a shell towards its base and wider than the shell body. It engaged the lands of the rifling to impart spin to the shell and prevent propellant gases escaping forwards. Rotating band in US terminology. For more detail see here. The ordnance and recoil system in the cradle that elevate together on the saddle. A vertical angle, measured upwards from the horizontal plane. A Tangent Elevation (TE) was such an angle that corresponded to a particular range between a gun and its target, a Quadrant Elevation (QE) was TE ± Angle of Sight (elevation or depression). These angles were measured in degrees and minutes. A way of recording and estimating barrel wear, from mid WW2 Range Tables tabulated the relationships between MV loss, measured wear and EFCs. Each propellant charge causes a different amount of wear, very little by the lowest charge a gun used rather more for its highest charge. 1 EFC usually represented one round from the highest normal charge used by a particular type of gun, lower charges were 'worth' less than one, super charges more. In some cases EFC values varied with the propellant type. The number of rounds fired at each charge was recorded in a gun's 'Memoranda of Examination' and gave the total EFCs fired, which indicated when a full examination was needed and enabled a revised MV to be calculated. Every type of unit had an establishment approved by the War Office’s Establishment Committee. The 'full' establishment was the War Establishment (WE), in UK in peacetime units were maintained at 'reduced establishment', and in some foreign postings some types of unit, notably infantry, could be on an establishment for 'Internal Security Duties' instead of WE. The Establishment stated the number of men by rank and regiment or corps (including 'first reinforcements'), armament (excluding personal weapons) and vehicles. In addition Army Form (AF) G1098 authorised the complete scale of all equipment, stores and 1st Line Ammunition for the unit. For artillery there was then an Organization for Manoeuvre that assigned a standard designation, role, radio fit and crew for each vehicle. Sometime after WW2 the term 'reduced establishment' was replaced by 'peace establishment (PE). See 'Artillery Organisations' for more details and examples. US equivalent TO&E or TOE. Modern equivalent 'At My Command'. Guns reported 'Ready' to their CP, CPs at each level reported upwards leading to officer controlling the engagement (usually a forward observer), when this officer consider that enough had reported Ready or it was the right tactical moment, he ordered 'Fire' so that the guns opened fire at the target within a few seconds of one another. In smaller concentrations, eg regiment, he could know the different times of flight and order fire to individual fire units so that all first rounds landed together. The language of fire control. Used between command post and guns, and by observers, etc, and command posts. In involved procedures and terms with precise meanings to ensure there was no confusion in fire orders. See 'Fire Discipline' page. Ammunition, of all types, carried by a unit in its own transport or by its soldiers. Scales (quantities) were set by War Office policy and was matched to the unit's transport capacity. 1st Line Reinforcements Men on a unit's War Establishment and held by the unit to replace casualties. Locating a point on the earth's surface by map (grid) reference or co-ordinates (and height) with sufficient accuracy for purpose. Fixation was determined by survey processes. A Base Ejection (BE) shell that ejected coloured flare canisters, without parachutes, for target marking at night. FDL. The forward most positions, the 'forward edge of battle area' in more modern terms. DA fuzes functioned instantaneously by mechanical action of the ground compressing the fuze nose. But they did not function at very low angles of descent (about 2°), depending on shell shape and the hardness of the ground (on hard ground they could ricochet without the fuze nose making contact). More details in 'Ammunition'. Graze fuzes functioned at all angles of descent but with a delay of about 0.01 second, with some being designed for longer delay. They did not rely on the fuze nose being compressed but on the slight but sudden retardation of the shell. More details in 'Ammunition'. Time fuzes used combustion (gunpowder, officially called 'igniferous') or clockwork (MT) to measure the time from when they were fired until they were to initiate the shell in the air. This period was called the 'fuze length'. Time fuzes had to have the required accurate length set on them before being fired. For most UK fuzes this length used an arbitrary time scale, not seconds. More details in 'Ammunition'. A hand tool similar to a spanner used to manually set a fuze length on a time fuze. Sometimes referred to as a ‘fuze bar indicator’ on account of its shape. 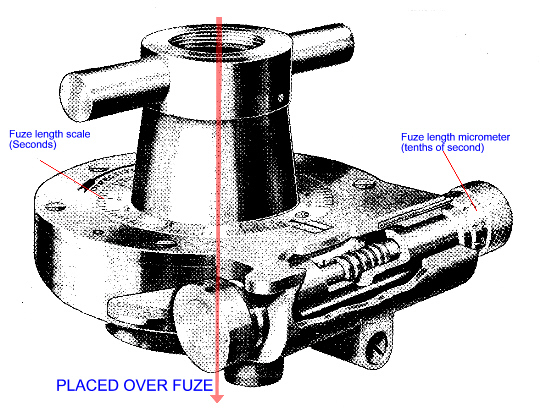 Not to be confused with the Fuze Setter (picture) that set the fuze length onto the fuze. A fuze indicator converted range to a time fuze length, taking account of MV and corrector settings. There was a separate instrument for each charge and gun combination. Picture. More details in 'Ammunition'. A mechanical device that was set to the required time fuze length and then used to set that length on fuzes (picture) . In field artillery fuze setters were manually set and operated. GHQs commanded all land forces in a theatre, they had an MGRA. In WW2 there were GHQs for the BEF in France 1939-40, Delhi and Cairo. After the fall of France GHQ Home Forces was formed to command the armies involved in any fighting in UK. GHQ in India had extensive responsibilities including war production. Regiments used different equipment for particular operations. AA regiments manned 7.2-inch Howitzers in Burma (2 guns held by ordnance parks in each corps) and multiple rocket launchers in the final months in NW Europe. Field regiments used mountain guns in Italy, 5.5-inch in Burma and 105-mm SP during the run-in fire plan on the Normandy beaches. Anti-tank batteries were double equipped with mortars in Burma (3-inch) and sometimes operated them in Italy (4.2-inch). Battery Grid - Fixation and orientation originated and used in a battery using basic survey, such as magnetic compass and map resection. Regimental Grid - Fixation and orientation originated in a regiment and used by its batteries. Theatre Grid - Fixation and orientation accurate to the map grid. A distinctive feature, ideally with a distinct vertical edge or point, and several thousand yards away to give effective infinity selected by the No 1 of each gun as the reference point for laying. Normally at least two GAPs were selected and the angle to them recorded when the gun was oriented in its Zero Line (later Centre of Arc). GAPs were originally called 'auxiliary Aiming Points'. Parellelescopes and aiming posts were also GAPs. More details in 'Sights & Laying'. Not used in WW2. It had previously referred to a correction to line or range applied at the gun. For example a constant correction to correct for unlevel trunnions on a gun without sights that could cross-level or a correction to for the gun's difference from standard muzzle velocity. Gun Drill The formal duties in action of each member of a gun detachment. The drills covered bringing the gun into and out of action, and while firing. It was a critical part in the basic training of gunners. Every man learnt the duties of all positions (Numbers) in a gun detachment as a drill for a specific gun, although drills such as laying were common to most guns. It ensured that all members of a detachment were trained in all roles, which minimised the immediate effect of casualties. Having different duties defined by well developed drills also ensured the guns were served fast and efficiently, and minimised the need for orders. Roughly, 'fire for effect' in modern terminology. All guns involved fired the ordered number of shells (after ranging if the target was not predicted), each gun fired when it was ready. In contrast 'salvos' meant that guns fired together, 'troop fire' meant each gun fired in turn with an interval in between. Gunfire was fired as quickly as possible unless an interval (specified number of seconds) had been ordered by the originator. Single rounds of Gunfire were used, instead of ranging, against a moving target. The practical application of the science of ballistics. Not the same as artillery staff. Graduates of 12 month courses (shortened during WW2 to 3 months then 5 months from 1941), one for officers, usually captains and one for sergeants who became Warrant Officers on completion. Thereafter the WOs’ careers were invariably entirely as members of the gunnery staff, and many Master Gunners were commissioned as permanent members of it. The officer graduates often did only one posting as a member but a significant number of WW2 artillery commanders were its graduates. During WW2 the term GPO meant the subaltern officer responsible for a troop gun position. He was responsible for orienting and maintaining the troop's parallelism and for the production of firing data in the troop CP. Before 1938 the term applied one of a battery's section commanders who had similar responsibilities for the entire battery. The role appeared around the end of WW1. With the reversion of 6 gun batteries in the late 1950's the GPO again became responsible for the entire battery, particularly reconnaissance and preparation of battery positions. An instrument at each gun that converted ranges to tangent elevations corrected for the Muzzle Velocity (MV) of the gun. Its scale had cursors for each charge that were set to the gun’s current MVs. The cursor for the ordered charge was then aligned with the ordered range marked on another scale. Usually fitted to British guns as an integral part of the sights (calibrating sights) for one-man laying such that a bubble in an arm aligned to the range scale was leveled by physically elevating the gun barrel to the required elevation. Separate 'bar' form gun-rules were use with guns (eg US origin) where they could not be integrated with the sights and for intermediate charges (eg 2½, etc for 25-pdr). In WW1 early gun rules were called 'correction rules'. Picture. See Probert Pattern. More details in 'Sights & Laying'. Howitzers have multiple charges and can usually fire in both upper and lower registers. Traditionally UK designated guns by shell weight, eg '18-pdr Gun' and howitzers by calibre, eg '6-inch How'. In WW2 there were few modern true 'guns' in field artillery (none used by UK apart from residual 18-pdr) and the term 'gun-howitzer' was sometimes used for those with multiple charges but firing only in the lower register. However, the term 'gun-howitzer' never became widely accepted in UK, and why use a polysyllabic word, 'howitzer', when a single syllable 'gun' will do? Verbosity is a military vice not a virtue. High Explosive Squash Head, called HEP in the US. A shell designed to 'pancake' against hard targets. Developed in WW2 by a naval officer, Sir Denistoun Burney for use with his large calibre recoilless rifles against bunkers. Subsequently used for anti-tank. Headquarters RA at division and corps HQs (or AGRA), the CRA/CCRA’s staff headed by the Brigade Major RA (BMRA). Impromptu Target A target of opportunity that had not been foreseen and planned for. There were six types of impromptu target. Artillery fire has to be used when the target cannot be seen through the gun's sights. Indirect fire requires firing data to be set on the gun's sights. Indirect fire may be observed, by a forward observer or target acquisition system, or predicted. See 'The Field Artillery System' and 'The Basics of Gunnery'. Part of an ordnance, a snug fitting sleeve around at least part of the barrel (which may be called a loose liner in this use) and adds to its longitudinal strength. Fitted with slides that engage the slides of the cradle. A loose jacket is called a slipper. The process of aiming the gun using its sights. Every artillery regiment had a LAD, initially this was Royal Army Ordnance Corps then Royal Electrical and Mechanical Engineers when this was formed as the equipment repair corps. The LAD repaired equipment beyond the capabilities of the RA tradesmen in batteries or took more time than was acceptable in a battery. Originally a wheeled and detachable part of a gun carriage that enabled it to be horse drawn by supporting the gun trail and providing the means for hitching the horse team to the gun carriage. It also carried ammunition and often members of the gun detachment. It ceased to be essential when vehicles replaced horses, but was retained with some guns, notably 25-pdr, and renamed as an 'ammunition trailer'. One man in each gun detachment was usually appointed 'limber gunner' and responsible for routine maintenance of the gun. Link Shooting The procedure between troop CPs where one troop ranged the target and then provided firing data to the other troop. These were several methods but Tetley Fan and Window methods replaced the DW Plotter and rapporteur methods. See Fire Control 1939-45 page. A linear target is one along a straight line, with guns aimed along it at equal distances from one another. The term was introduced after WW2. The line is oriented on a bearing. A post-war term for target acquisition, survey and meteorology. The device, mounted in the slide that held the tube in a BL breech block. The term originated with early cannons and muskets (eg 'matchlock' ). The switch, distance (range) and angle of sight from pivot gun to target as calculated or measured from the map without corrections for non-standard conditions. Provided a record of wear measurements, repairs and modifications, and maintenance and rounds fired by the barrel as 'Equivalent Full Charge' (EFC). Replaced by Gun History Book in about 1949. Met data is essential for predicted fire, it enables corrections to be made for the non-standard wind speed and direction, barometric pressure and air and charge temperature. CPs combined met data with other data for non-standard conditions to produce the Correction of the Moment. Data was distributed to CPs by Meteor Telegram, charge temperature was measured by gun detachments. See 'Meteor'. Also called 'Met Report', US equivalent ‘Metro Message’, today ‘Met Message’. Instructions for conversion between US and British messages were given in Range Tables Part 2, 1943. Gave air pressure, wind speed and direction for times of flight of 5, 10, 20, 30 , 40 and 50 seconds. Major General Royal Artillery. The senior artillery officer in an Army Group, Theatre or equivalent level headquarters. Mil A unit of angular measurement used on the sights of US guns, 6400 to a circle. Different mils were used in European armies, eg 6000 to circle in the Red Army. The Royal Artillery was considering adopting mils in 1914. See 'Units of Measurement'. The structure of a gun that supports the ordnance and has no wheels in contact with the ground when firing (contrast with carriage) More details in 'Gun Structures'. A type of engagement invented by the CRA 2 NZ Division in about mid-1942, ie about the time the new multi-battery procedures for Mike, Uncle, etc, Target were introduced. It was a concentration of pre-planned Defensive Fire by a division's field regiments (72 guns) onto a single point. It was used in N Africa and Italy by 8th Army. In essence is was a concentration, without ranging, of regiments firing gunfire for a fixed period, typically 2 or 3 minutes. Originally it was called 'Method A'. The part of a BL breech that is mounted in the breech block and provides obturation, a chamber for the tube and is penetrated by the axial vent. The velocity at which the shell leaves the muzzle and is different for each charge. It overall decreases as the barrel wears so calibration firing was periodically undertaken to determine it. It also is affected by propellant temperature, variations between manufacturing batches of propellant, and other factors (such as barrel memory). See 'Calibration' page. The most succinct definition was used by British operational research scientists in 1946 ‘To prevent enemy movement and observation, and in cases of greater effect to prevent the effective use of enemy weapons. Effect to last during the bombardment.’ It is a psychological effect; casualties to men and equipment are a bonus. The term ‘suppress’ is now used for this and neutralize has a different meaning. The slant range to the target is greater than the horizontal range and applying the angle of sight does not compensate for this, which is called 'non-rigidity of the trajectory'. The size of the correction for this depends on the difference in height between the target and the gun, and the shell’s angle of descent. The firing data in range tables were for standard conditions of atmosphere, propellant temperature, muzzle velocity, projectile weight and trajectory with zero angle of sight. Range tables also provided data to make corrections when conditions varied from standard. A consequence of non-standard conditions is that maximum range varies and an angular elevation gives different ranges under different conditions. British standard conditions were temperature 60 deg F, 30 inches barometric pressure and no wind. For an example see RT page. The title given to the commander of a gun, being the number for the role in formal gun drill where each member of a gun detachment had a number with particular duties when bringing the gun into or out of action and when firing. The term for sealing the rear of the breech chamber to prevent propellant gases escaping, provided by the breech in BL ordnance and cartridge case in QF. On-Call A planned target in a fire plan that could be ordered if and when required. The British term for the complete barrel assembly, typically comprising firing mechanism, breech, barrel and muzzle brake. US term is 'cannon'. More details in 'Gun Structures'. Alignment of horizontal angle instruments, such as a director, by reference to grid North with sufficient accuracy for purpose. Initial orientation was determined by magnetic compass or map measurement, then improved by survey processes. See 'Maps & Survey'. A type of GAP that was very close to the gun but provided 'virtual infinity' to compensate for the movement of the dial sight when the gun traversed or moved back ('bedded-in') during firing. A narrow mirror about 30 inches long positioned about 3 yards from the gun, the layer pointed his dial sight at its reflection in the mirror. The Mark 5, on Stands, Instrument No 27 was the standard one in WW2. More details in 'Sights & Laying'. Picture. An element introduced in major fireplans in late 1944. It involved a concentration of weapons firing into an area, these included tanks, mortars, anti-tank guns, LAA guns. Normally the right hand gun of a troop, it was the gun represented by the pivot for the range arm on the artillery board in the CPs. The pivot gun was replaced by battery centre as the point from which firing data was calculated in 1956 and the term lapsed. Equivalent to US 'base piece'. The term for a live firing exercise period. 'Destruction' in modern terms. A single gun was used to destroy a point target such as a building. The field clinometer was used for laying and the charge with the smallest Probable Error was used. In WW2 a correction to range in yards given to each gun so that its fall of shot would be roughly in a straight line with the pivot gun at right angles to the line of fire, or in a barrage along the barrage line or with concentrations to converge guns onto the pivot gun's aimpoint. Target is attacked without being ranged. Normally indicated by an 8 figure (10 yards or metres precision) map reference, and with correction of the moment data (either calculated or the result of a datum shoot) applied together with corrections for other variations from standard. Originally called 'map shooting' against targets selected from a map or air photograph. Predicted fire also required accurate survey at the guns. The process of calculating correction of the moment and applying these corrections to a range and bearing taken from a map or calculated from coordinates. Until soon after WW2 prediction was only used with predicted fire, after this it was always used. The converse of prediction is reduction. A statistical construct, similar to a standard deviation, used mainly to measure the dispersion (or consistency) of the fall of shot about the mean point of impact (MPI for the rounds of an individual gun but also for the accuracy of predicted fire. PE can be for range, for line, and for heigh of burst, and detailed in Range (Firing) Tables. 50% of rounds fell within 1 PE of the MPI, 100% fell within 4 PE, this PE varied with range and propelling charge. Circular PE could be used for the accuracy of predicted fire, the difference between the MPI and the aimpoint, if the PE of MPI as 125 yards all MPIs fell in a circle 500 yards radius. Since PE for different types of error can partially counter-balance one another they are combined using the root mean square method. See 'Errors and Mistakes' for more detail. Probert Pattern Sights A form of Calibrating Sight introduced in the 1930's and used with all British guns except 3.7-inch How. Its distinguishing feature is a flat quadrant engraved with range curves, for 25-pr this quadrant was wrapped into a cone. Probert sights could not be used about 45° elevation. See Probert pattern. Engagements that were scheduled, either concentrations or a barrage. Basically the term was synonymous with fire plan. The schedule could be a Task Table or a marked map or map trace, these provided target locations and instructions for when each target was to be fired and the type and quantity of ammunition each battery was to use. By the 1960s the term had generally been replaced by Fire Plan. The low explosive used to propel a shell. Packaged into charges, which in turn composed cartridges. Most UK propellant was 'double-base' but there were different formulations called 'types' or 'natures'. The US generally used the term 'powder'. More details are in 'Ammunition'. Bringing a battery into action from the march in response to a target ordered by an observer. These actions were quite widely used in N Africa but in the second half of WW2 such targets were more usually passed to another unit that was in action. A type of ordnance where a brass cartridge case contained the propellant charge bags and provided obturation. Picture. More details in 'Ammunition'. Four different HF wireless sets operating in overlapping parts of the 2 - 9 megahertz frequency band provided communications within most artillery units. See 'Artillery Communications' for more details. The standard armoured vehicle radio. A manpack radio having a range of about 5 miles with a tactical antenna. Used by FOO/OPO to communicate with infantry. The standard portable radio used by the British Army, it could be vehicle installed or dismounted. It was widely used in artillery regiments and formations, and fitted to AOP aircraft. A manpack radio used primarily in infantry companies. Issued to FOOs and fitted to OP tanks for communications with supported infantry. Firing Table in US terminology. Provided data to set up the correction of the moment graph and make corrections for non-standard ammunition, other variations and non-rigidity. It also provided data to convert range to Tangent Elevation, gave times of flight, and probable errors. Every gun had range tables for every type of ammunition available for it. See 'Basics of Gunnery' for examples and 'Ballistics & Data' for more details. Adjustment in modern terms. The process for obtaining the correct line, elevation and fuze length for engaging the target by observing the fall of shot and ordering corrections. Standard British practice until about 1950 was to correct onto the imaginary line through battery and target (BT) then bracket the target along it using a section of 2 guns. The height of burst of HE shells with time fuzes was usually ranged by ordering a change to the corrector setting. See 'Basics of Gunnery' for more detail. Named rates of fire (Intense, Rapid, Normal, Slow and Very Slow) in rounds per minute, the actual number of rounds varied with the type of gun. Intense rate was the maximum sustained rate that the gun could fire without overheating. This system evolved in WW1 and was standardised by GHQ Artillery Circular No 10 in May 1918. See table. A wireless communications technique whereby (typically) a manpack wireless communicated to another, which was adjacent and directly connected to another more powerful radio that rebroadcast on a different frequency. The rearward movement of an ordnance, before the introduction of recoil systems in the late 19th century the entire gun moved backwards. Recoil systems comprise a buffer that absorbs the recoil of the ordnance and a recuperator that returns it to its firing position on the carriage or mounting. This absorbs most of the recoil force leaving a residual amount to be transferred to the ground by the gun's carriage or mounting. Almost all British recoil systems used hydraulic buffers and hydraulic-pneumatic recuperators. Muzzle brakes also reduce recoil forces. More details in 'Gun Structures'. Dial sight carrier that could be cross leveled to keep the dial sight vertical when the trunnions were tilted due to unlevel ground. All British WW2 guns had reciprocating sights. Before these sights the gun No 1 applied a correction to his switch (called 'deflection' at the time) to compensate for the gun wheels being on a side slope. Originally this type of mount was called 'oscillating' when it was introduced for direct fire telescopes. That part of the recoil mechanism that controls run-out. Usually a hydraulic-pneumatic cylinder where the recoil force compresses air (or other gas), which then expands to return the ordnance to its firing position. For more details see 'Recoil and Runout'. A process used to derive map co-ordinates for a target registered by firing. The term was not introduced until after WW2 although the process was introduced in WW1. Variations for non-standard conditions were removed to give map data, from which the target location was calculated by bearing and distance from the pivot gun. Reduction is the converse of prediction. The British Army refers to its 'branches' as ‘regiments and corps’, in this context artillery is a regiment. The basic artillery unit, battalion size with 2 - 4 batteries. The title included a term stating the regiment's role. For gun regiments this was in terms of the calibre of its guns, eg Field Regiment, Medium Regiment, Heavy Regiment. Until 1938 these regiments were called ‘field brigade’, 'medium brigade', etc, in the case of field artillery. The term 'brigade' for a unit of several batteries had been introduced in the 19th Century because a battery was officially a 'unit' and units were grouped in brigades. Batteries became sub-units in 1938. ‘Adjustment for future engagement’ in modern terms, silent registration meant not shooting at the target ('silent marking' in modern terms). A registered target could be ranged or predicted. Ranged targets were reduced unless they were expected to be short-lived, such as those for a quick low level fire plan. Registered targets were always given a target number. A round of ammunition comprised a projectile (shot or fuzed shell), a propelling charge and a means of igniting the propellant. Usually shortened to ‘Royal Artillery’ and abbreviated as RA. Part of the superstructure of the carriage that pivots horizontally (to provide top traverse) on the basic structure of the carriage or mounting and enables the trunnions attached to the cradle to pivot vertically (to provide elevation). 'Concentration and Position Correction Chart', Army Form B2596, with instructions for use in AF B2596A. It was used in CPs to find concentration and position corrections for individual guns relative to the pivot gun. It lasted until 1956 when battery centre was introduced. It was replaced by the Displacement Calculator. The ammunition scale (quantity) authorised to a unit by War Office policy but carried in formation transport. A method of ordering a number of rounds Gunfire that compensated for guns or units engaging another target, moving or out of action. If a field regiment was ordered 'Scale 4' and one of its 3 batteries was engaged on another task then the other 2 batteries made up the fire of the 'missing' one by firing 6 rounds Gunfire. Traditionally the term used for the 3 subaltern officers in a battery, each of whom commanded a section of 2 guns in barracks and in the field, analogous to an infantry platoon commander or a cavalry troop commander. The term lapsed in the 1938 re-organisation. In 1942 it was resurrected to mean any officer, warrant officer or NCO temporarily appointed to supervise a section of 2 guns in action. The parts of the army whose primary duty was to supply the fighting troops with what they require, or to perform some necessary service to them. Most services were controlled by A or Q staffs in HQs. Twice the 50% zone at the current range and charge, rounded up to the next 50 yard. Invariably 50, 100 or 150 yards. A solid and inert projectile. In WW2 only used for anti-tank. First used about 1800 and withdrawn from UK service after WW2, it was had some use in the first years of WW2 with guns of WW1 era. The shell was activated by time fuze to project a cone of lead bullets forward in a shot-gun like manner. The term is widely misused to mean the fragments from a bursting HE shell. Smoke Screen Base ejection smoke shells aimed in a line so that their smoke blinded the enemy and or screened own troops for a required time. The alignment of the screen and the distance between aimpoints depended on wind speed and direction as well as the screen and blind areas. See Fire Planning for more details. A method of locating hostile artillery using a line of microphones and recording the different times of arrival of the sound wave at each microphone to enable the guns' position to be deduced. See 'Target Acquisition and Counter Battery' for more details. The British Army had three staff branches, G (operations and intelligence), A (personnel, administration and discipline) and Q (supply and materiel). These branches existed from brigade level HQs upwards. The senior G staff officer in an HQ was the 'first among equals'; the British did not operate a formal 'Chief of Staff' system in lower level field formations although a Brigade Major acted as one. At lower levels A and Q were often combined. British staff nomenclature could have been designed to confuse foreigners, although it was quite logical. For 'G' staff there were three grades - GSO 3 - 1 (captain to lieutenant-colonel), above that they were called 'Colonel General Staff', BGS or MGGS. However, at brigade and equivalent level (ie HQRA) the GSO 2 was called the 'Brigade Major' (or Brigade Major RA in HQRA). 'A' and 'Q' staff officers (apart from staff captains) were 'Adjutant Generals' and 'Quartermaster Generals'. At divisional level there was an Assistant Adjutant and Quartermaster General (AA & QMG, lieutenant colonel) with a Deputy Assistant Adjutant General (DAAG, major) and a Deputy Assistant Quartermaster General (DAQMG, major). Above divisional level there were QMG, AAG & QMG, DAG, etc with ranks appropriate to the level of HQ, up to and including General. Units did not have staff officers (or an Executive Offccer (XO)), although the Adjutant was responsible for G and A matters and the Quartermaster for Q.
Parachute flare delivered by Base Ejection (BE) shell, 'Illumination' in modern terms. Line of departure in modern terminology. Crossed by assaulting troops at Zero Hour. A pattern of fire on the ground, probably first developed 2 NZ Division in mid 1942. It evolved in N Africa where individual divisions and regiments had their own versions, initially simple concentrations, and generally used for Defensive Fire. It was subsequently standardised as a 525 yard linear, oriented as required, with regiments of different types each covering the full length. NZ used a 1200 × 600 yard pattern, later changed to 600 x 600. Stonks lasted into the 1950's when they were replaced by standard Linear Targets. A general term for a commissioned officer below the rank of captain. In the Royal Artillery in the 20th Century it meant a 2nd Lieutenant or a Lieutenant. The part of a carriage or mounting that directly supports the ordnance. Includes the recoil system in the cradle and saddle. Gun positions (and target acquisition devices) have to be surveyed to provide them with accurate fixation and orientation. Ideally survey should be accurate to the map grid in use, but an intermediate step of all being on a common grid was used. Survey processes used trigonometrical methods to 'carry' fixation and orientation from accurately known points. Accurate survey is essential for predicted fire, without it guns must always be ranged. Batteries could be surveyed in sympathy together but not accurate to the map grid, sympathetic survey was essential for multi-battery concentrations. See Maps and Survey for more details. A method of spreading fire over an area larger than a battery. The terms could be used separately or together. 'Sweep' means spreading fire out laterally, left and right of the line of fire. 'Search' meant spreading it along the line of fire. The gun fired each round at a different line or range to its preceding one. A typical order might be 'Sweep 200 by 50', this meant that the gun traversed 200 yards left and right in 50 yard increments. British practice was to do this by partial turns of the handwheel not by calculation and accurate laying. The method was introduced before WW1 and lasted until ABCA procedures in 1965. See fire discipline. A horizontal angle relative to the Zero Line, 8 deg right of the zero line was ordered as ‘8 degrees’ and 8 deg left as ‘352 degrees’. The term ‘deflection’ was used when ordering individual gun displacement corrections ('concentrations'). 'Switch' was similar to deflection in US terminology. During ranging switches were cumulative and ordered as 'More 1 degree 20 minutes' or 'Less 1 degree 20 minutes' , the former moved the line of fire to the right, the latter to the left. Territorial Army, part time volunteers mobilised on the outbreak of war. Basically the equivalent of the US National Guard. Vehicle markings. In most theatres each type of unit displayed a divisional or formation symbol and a unit code number on a coloured background that was different for each arm, artillery was horizontal red over blue. Unit code numbers varied between theatres, these code numbers had no relation to the regimental number. Details for NW Europe can be found at www.ra39-45.pwp.blueyonder.co.uk/mark/index.html . Artillery units also displayed smaller signs that signified a vehicle's role, for example ‘Z’ for COs and ‘X’ for BCs, 'RA’ and ‘RB’ for the troop commanders in a battery, ‘GA’ and ‘GB’ for GPOs. These were also quartered differently for each battery in a regiment. In WW2 these were often quartered to highlight the battery, eg if the second quarter (going clockwise) was highlighted and the letter was X it meant the BC of the second battery the particular regiment. Target Numbers Registered targets were given a target number. These comprised a prefix letter and a number from 1 upwards. Blocks of numbers were allocated to units and HQs for the targets they ordered to be registered. Prefix letters indicated the extent to which the details of a registered target were to be circulated. P, R, S and T were used by batteries for their own targets, M meant the details were circulated to all batteries in the originating regiment and U to all in a division. N was used for divisional counter battery targets. The traverse by rotating the saddle on the saddle support, ie without moving the trails. Top traverse for 25-pdr was 4° left & right, for 5.5-inch it was 30° left & right. The first rounds of fire for effect from all batteries are timed to arrive together. Batteries fire at ToT minus their time of flight. Introduced by the re-organisation of 1938 where there were two or three troops per battery, each troop having 2 sections, each of two guns. Until mid 19th Century when the term 'battery' was introduced it was used instead of 'company', and in the Royal Horse Artillery 'troop' which reflected the cavalry's use of 'troop' instead of 'squadron' at that time. Provide the rotational axis for elevating the barrel in its cradle. Horizontal cylindrical projections either side of the cradle that rotate vertically in the saddle. The separate percussion 'primer' used with BL ammunition, about the size of a rifle cartridge and inserted in the 'lock' fitted to the outside rear of the breech block. British tubes were 0.5 and 0.303 inches. Units of Measurement Until NATO standardisation UK used imperial units of measurement. Those for angles and distance, including those used by other nations are here. Other gunnery ones are here. Firing at an elevationgreater than 45°, now called ‘high angle’. The highest point on a shell's trajectory. The US usually uses the alternative term 'maximum ordinate'. VT Fuze A new type of airburst fuze released for field artillery use in December 1944. It entered AA use earlier, but concern over it being captured and copied delayed its field use. The original technology was developed in UK in the early years of the war but development was transferred to the US. 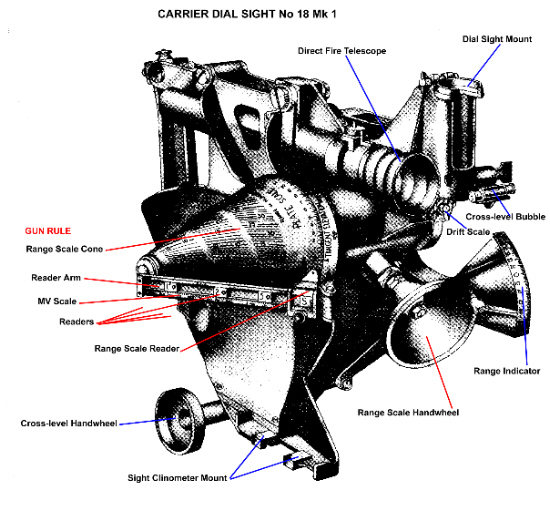 In essence the fuze used a radar proximity function to determine when it was at about 30 feet above ground. A timer was added after WW2 to prevent the fuze transmitting until it was close to the target, this prevented early bursts and limited hostile EW effects, some modern VT fuzes provide options for different heights of burst. The 'sergeant major' ranks above staff-sergeant. Class 3 (introduced in 1938) was the rank of troop guides (Troop Sergeant Majors), Class 2 the rank of Battery Sergeant Majors and Class 1 the rank of a Regimental Sergeant Major. WO Class 1 were called ‘Master Gunners’ if they were gunnery staff. As guns fire their barrels wear and the muzzle velocity for every charge becomes less, which reduces range. Wear is caused by erosion, abrasion and corrosion. Corrosion is prevented by proper cleaning. Abrasion is caused by friction between the shells' driving bands and the bore but is not very significant although dirt on shells or in the barrel can cause significant abrasion. The main problem is erosion and has several components, chiefly the heat effects of burning propellant on the bore's surface. The more heat the faster the wear: hot burning propellant, high charges having more propellant or high rates of fire giving little chance for the bore to cool. Basically hot propellant gases give the bore a brittle surface layer that is removed by abrasive action by gases, propellant particles and driving bands. However, this erosion is mostly confined to the area around the commencement of rifling, so the projectile is rammed a greater distance, which increases chamber volume so reducing gas pressure and reducing muzzle velocity. There is also more wear in the grooves than on the lands. Well worn barrels, particularly ovality at the muzzle, cause shells to be less stable in flight and this further reduces range. See EFC. The thread used with a screw breech, it was a non-tapering thread with 3 steps, each covering an arc of about 40 degrees. The three steps were repeated to cover the circumference of the chamber. Telegraph communications (ie using continuous wave and Morse code) by wireless. A point some distance from a target, but accurately located in relation to it, which could be ranged without losing surprise against the target and the correction applied to data for the target. Check Point in US terms. Cavalry in the TA, most had been mechanised by 1939, but at the outbreak of war there were still 15 horsed yeomanry regiments, mostly assigned to 1st Cavalry Division that eventually became 10 Armd Div. Many yeomanry regiments were converted to artillery before or early in WW2, often retaining the yeomanry title as part of their name. The time at which attacking troops cross their start line. H-Hour in modern terminology. An imaginary line from a gun position, usually the 'centre of arc' to the expected target area. Until 1956 the guns were oriented relative to the zero line, which could be different for every battery. See Centre of Arc. Copyright © 2001 - 2014 Nigel F Evans. All Rights Reserved.